THE SP Papua New Guinea Hunters have finally settled on a home ground for 2016 with the National Football Stadium set to host the club’s home games in the Intrust Super Cup. The venue was previously described by Hunters coach Michael Marum as a natural fit for the club with its history as the former Lloyd Robson Oval which was the home of the Port Moresby Rugby League as well as the country’s main venue for international matches as well as inter-city finals. It is a win-win situation for the South Pacific Brewery-sponsored club, developers Oil Search Limited and the NFS board of trustees with the 15,000-seat venue to be host 11 home games in the new season – eight night games and three day games. Importantly, the Hunters will not pay to use the facility, however, revenue generated from gate takings will be split with the larger share going to the venue owner Oil Search and the board of trustees. Oil Search and NFS trustees will confirm the ticketing prices as well as the percentage split on takings, according trustee board member and venue manager Leon Buskens. The Hunters play their first home game against Tweed Heads Seagulls in round three on March 19. 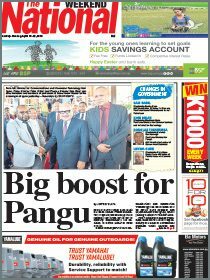 This official announcement was made by the SP PNG Hunters chairman Graham Osborne in the presence of Sports and Tourism Minister Justin Tkatchenko, Oil Search Ltd executive general manager Gerea Aopi and PNG Rugby Football League chairman Sandis Tsaka at a press conference at the NFS yesterday. NFS trustees Busken, Michael Uari, Dr James Naipao, Wari Varage and Jack Kedea witnessed the occasion and commended both parties for sealing the deal in what they described as a boost for the stadium and the code’s profile. The decision by PNGRFL and Hunters to opt for the NFS over the Sir John Guise Stadium was made on Tuesday night. Osborne broke the news of NFS as the home of the PNG franchise for one year with an option to continue to 2018. Tkatchenko added that it was a “fantastic and great” announcement for rugby league and the best news for the team as they prepare for the season opener against the Souths Logan Magpies in Brisbane on Sunday, March 6. 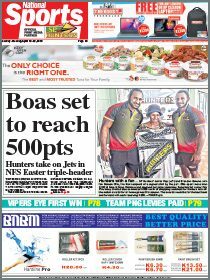 The NFS will not only host Hunters games in 2016 but will also be used for high profile matches such as the Digicel Cup games and the Prime Ministers’ XIII fixture. However, Aopi said the NFS would not be used every weekend to preserve the quality and integrity of the surface. Tsaka said he was proud that an agreement had been reached to allow the Hunters to focus on their campaign in the club’s third season.